First, we had the opportunity to purchase books from Mr. Hadley's library, and now we can buy a bit of his creative process too! 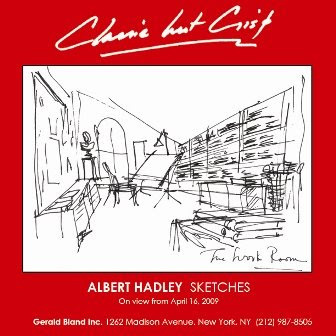 Gerald Bland will be exhibiting a selection of Mr. Hadley's sketches that were drawn throughout his career. This is really a wonderful opportunity to own a bit of America's design history. And if you're not able to visit the exhibit, I would suggest reading Albert Hadley: Drawings and the Design Process . It's a great book that provides insight into Mr. Hadley's vision. I'll be in NYC that day--hope I can go! Where and when was this, and what books were they--and are any still available? This is a wonderful opportunity Jennifer. You need some of those sketches for your chic new place. I Want Everything In This Room!